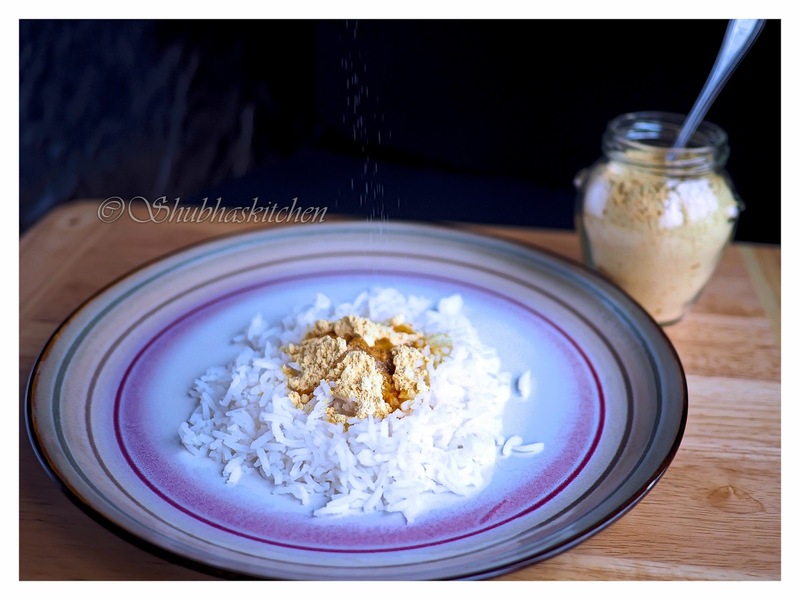 I am here again with yet another recipe belonging to Maharashtrian cuisine. If you have read few of my earlier posts, you would know that Maharashtrian cuisine is very close to my heart. The flavors, the fond memories associated with the dishes..they all make it so special. As a child , I was very fond of my Maharashtrian neighbour. She would make me so many yummy dishes..One dish I clearly remember was a delicious spiced powder. My aunt used to serve it with soft cooked rice . She would liberally drizzle ghee/clarified butter on top and season it with salt. I still remember the taste..YUMMM!! This spiced yellow powder was METKUT. Metkut is an authentic Maharastrian recipe. It is a Maharashtrian spiced powder made from dry roasted rice, wheat and lentils along with spices . It is very easy to digest and can be consumed daily. It is eaten with hot cooked rice along with ghee / clarified butter. This powder is also served with soft over cooked rice to little kids. It is especially more beneficial when you are sick or have an upset stomach. Dry roast Chana dal, Urad dal, rice, wheat. cumin seeds, coriander seeds, dry red chillies and fenugreek seeds separately on low heat . Grind all the above ingredients along with dry turmeric root, dry ginger powder, cardamom, nutmeg powder and asafoetida into a fine powder. Run through the sieve to get rid of any coarse bits. 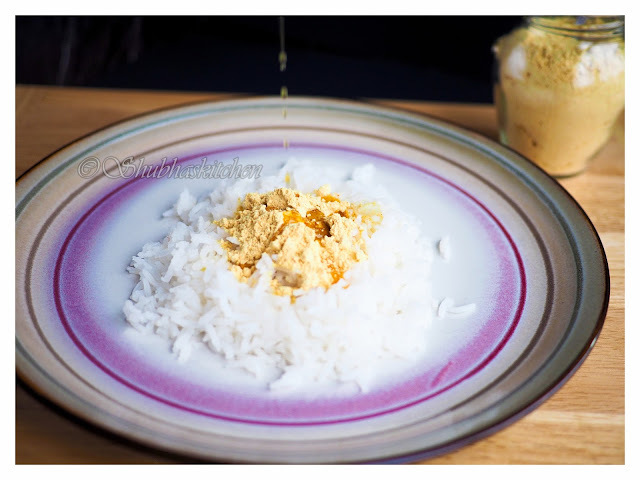 Serve this powder with some hot rice along with ghee/ clarified butter and salt. You can even consume Metkut Bhaat when you are sick or have an upset stomach. Excellent shrare dear. We use a similar powder called menthyada httu which is my absolute favorite and go to . This Metkut reminds me so much of the same. So handy when in need for another course with rice and soo flavorsome with ghee. too good and healthy. Wow, this is really new to me, I love spice mixes from around the world! So you have it on rice, is it used as a marinade or anything like that? Oh dear I Can almost get a whiff of this fragrant powder with a generous drizzle of ghee on piping hot rice, simply yummmmmy Shubha. The picture with ghee being drizzled from top has me drooling. Love these spoonfuls of punch and taste. How beautifully they seem to uplift even the most humble meals. Was not familiar with spiced powders during my growing up years , until I came to Bangalore for my engineering. From then on I have been hooked to podis. This one as Padma mentioned uniquely combines both rice and flour. Looks totally delightful dear. 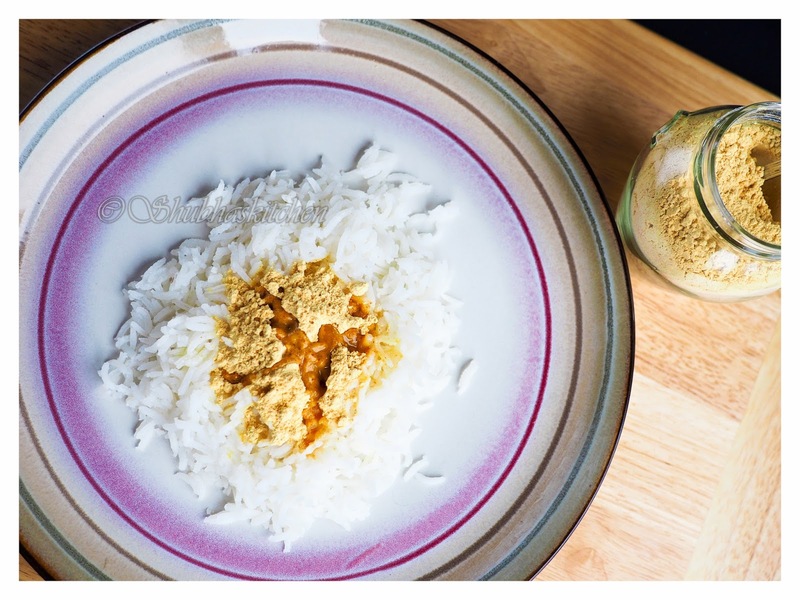 This spice powder with rice and ghee sounds heavenly. I would love to try. This is slightly different from our version. These are really useful esp for dinner. your recipe is very much similar to the recipe called gun powder. People from South India makes gun powder as a side dish for Idli and dosa. Like the way the ingredients are arranged for photos. Goes to show your involvement & care that you take to present well. Amazing Shubha.